Depending on your use-case, some tools might be better than others, but all will save you time in the debugging process. Popping up messages with `alert()`. Logging lines to console with `console.log()`. Pausing code execution with the `debugger`. The `debugger;` statement will pause code execution wherever you insert it in the code. The `debugger` statement will function as a breakpoint, pausing code execution. This allows you to investigate with the dev tools while the code is in a paused state. Firefox users in the past have relied on Firebug, an extension which gave Firefox users a set of competitive developer tools. The Firefox Developer Tools included in the latest versions of Firefox absorbed the functionality of Firebug. This brings the Firefox browser and its built-in tool suite on par with Google Chrome. Users of Safari have to enable the Safari Develop Menu to gain access to Safari’s built in developer tools. For more information on the various parameters and configurations that VS Code can use when debugging Node.js, check out the Node.js debugging documentation. Additionally, Postman has a feature entitled “Collections”. Collections allow you to save sets of requests and responses for your application or for an API. You save valuable time when collaborating with others or repeating the same testing tasks. When using Postman collections, you update the collection if necessary and then use it. This is much faster than repeatedly writing out every test. It can be incredibly difficult to spot syntax errors or keys which have obviously incorrect values when looking at unformatted JSON. If you have a condensed or “minified” JSON object, missing line returns and spaces, it may be a challenge to read. You need to be able to quickly scan that object and check for errors in formatting or content. Webpack is a bundling tool used by developers for all manner of sites and applications. If you use Webpack to do your bundling, you have the advantage of the stats data available from the tool. This data can range from module contents, build logs and errors, relationships that exist between modules, and much more. If you already use Webpack, this is an incredibly useful feature that sometimes gets overlooked. You can even use pre-built tools, such as the Webpack Analyse Web App, to visualize the stats that you generate from Webpack. 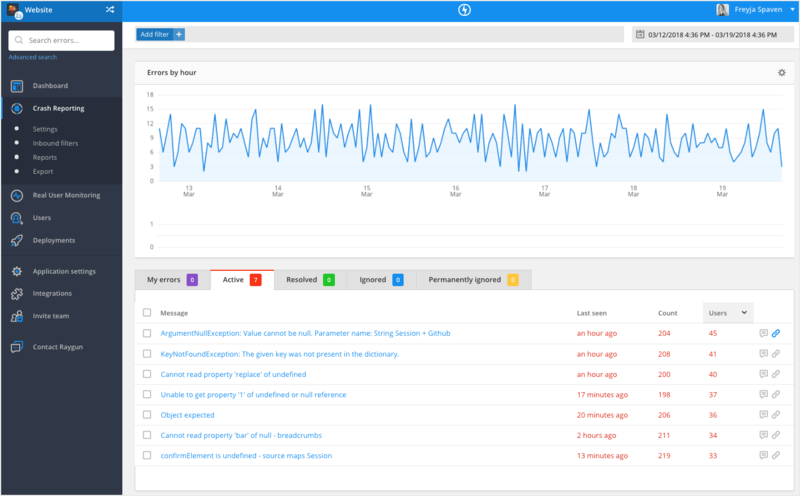 SessionStack is a monitoring software that provides you with a set of monitoring tools. These tools collect client-side data and assist you in figuring out exactly what your clients are doing on your website. In situations where problems occur, being able to track precisely what happened and how is vital. This is where SessionStack shines. SessionStack uses a video replay to help developers replicate user issues and error conditions. Tip: If you use both SessionStack and Raygun, you can attach SessionStack video replays to Raygun reports. 2. Insert the following snippet somewhere in your application’s `<head>` to fetch Raygun’s script asynchronously. 4. At this point, Raygun will begin collecting data and notifying you of issues. Awesome, right? Every application and use case will be different, but learning about new tools will help you find out what your best options might be.